Which is the Best Over the Range Microwave for You? If you are familiar with an over the counter microwave, an over the range type is basically the same. The only difference is that it’s not meant to be positioned on the countertop since it’s installed over the range (that’s why it’s called that way, in the first place). Since this is placed in a hanging position, some of its features are different from a regular microwave oven. For instance, the venting system of this unit can usually be found at the bottom, at the top, or at the back. With over the counter models, vents are usually found on the sides. Still, over the range microwave installation is made to be easy because it comes with all the instructions and materials needed. To watch a video on how to install this type of kitchen appliance, click here. The space-saving feature of an over the range model is definitely one of its most important benefits. Since it will not crowd up your counter, it becomes a very practical kitchen appliance. The invention of the microwave oven has indeed improved our lives. 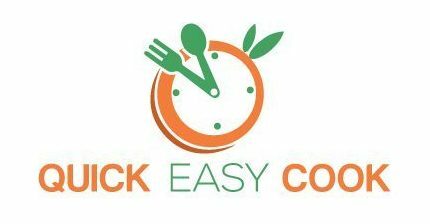 Since it offers a speedy and convenient way to cook food, preparing meals has been made easier for all of us. Well, convenience does come with a price – but you have a lot of options when choosing to buy an over the range microwave oven. Their prices can be anywhere from $100 to $1,000 (depending on the model). Keep in mind that this type of microwave is more expensive than countertop models, but you can surely find one within your budget. Needless to say, over the range microwave ovens are designed to be functional and stylish (well, at least, those are some of the benefits of this type of kitchen appliance). Just like regular microwaves, these over the range types are also equipped with features that make cooking, preparing, heating and defrosting food so much easier and faster. In fact, they come with a lot more features than those just mentioned. Just think of them as a regular microwave that can be installed over the stove. Because of its design, this type of microwave carries exhaust features that are more advanced than countertop types. They have external and internal venting system to make sure that hot air is expelled properly while cooking. Well, I’m sure you know how a microwave oven works. So, expect over the range models to deliver as many features. You will be able to monitor what’s going on inside the unit and there’s also a turntable to ensure even cooking (again, just like regular microwave ovens). With all the products that are available on the market right now, you can get the unit that carries the most features that are important to you. There are also several colors and styles to choose from – if you want to maintain a certain theme in your kitchen. In order to maximize the use of your over the range microwave, consider the following features before buying one. Power – This feature comes in the form of watts. So, check out the number of watts in a unit first (it’s one of the first things to consider). Your food will cook faster if you get a powerful microwave. For this type of kitchen appliance, get a model that has at least 1,000 watts. Capacity – Consider your usual meal preparations when deciding on the capacity of your microwave oven. For over the range microwaves, the usual capacity can be anywhere from 1.1 to 2 cubic feet. Note that a 1 cubic foot size microwave can handle meal preparations for 2 to 4 persons. So, if you have a big family, it would be wise to get a high capacity model instead of a small over the range microwave. Sensors – Models with sensors will be able to identify the type of food in the microwave. Furthermore, the unit will also be able to check if it’s being cooked at the right temperature (and make the necessary adjustments). Therefore, your food will always cook right (not undercooked and not overcooked). Convection Functionality – Getting a microwave oven with a convection feature is like getting an all-in-one kitchen appliance. Because of the additional oven functionality, you can also broil, bake, and roast food in your microwave. Made of steel – It’s made of tough materials. 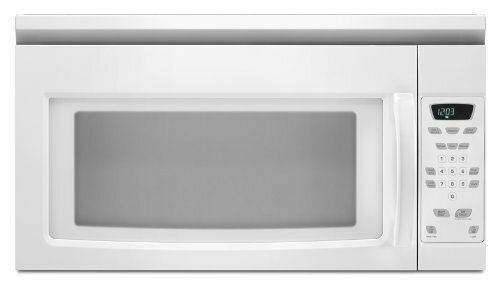 Nice color – This Amana over the range microwave comes in white color. Size and capacity are 1.5 cubic feet – It can handle food preparations for an average size family. 1,000 watts of power – You can quickly cook food with this unit. Patented touch magic control system – It’s very simple to operate. With built-in light – This can be adjusted in high and low settings so that you can easily monitor the status of your food in the microwave. Installing the unit is also trouble-free – Just follow the instructions in the manual. You can also choose from 2 venting options – at the top of the unit or at the back. Because of its simple design, this model carries only the basic functions of a microwave oven. I find this model to be simple – too simple, that it lacks some of the modern features that other units have. While it’s a good product, this is my least favorite of all the microwave ovens listed here. It’s a compact over the range microwave that has the lowest capacity in this top 5 list. If you are a Samsung fan and all your kitchen appliances are made by Samsung, this would be a good choice for you. Get to know more about it by looking at its features below. It’s stylish and it’s colored black – It will easily match and blend in with your other devices. With 1.8 cubic feet capacity - This model can accommodate large portions of food in one go. It’s powerful – It comes with 1,000 watts, and you can choose from 10 power levels when cooking your food in the microwave. Equipped with 400 CFM ventilation system – This over the range microwave has a 4-speed fan for proper ventilation. Patented Sensor Cook – This will ensure proper cooking all the time. It comes with a turntable feature that can be turned on and off – For even cooking, allow the turntable to rotate so as to allow proper circulation of hot air. But if you wish to use a large container, you can turn off said feature to accommodate it properly. Child-Lock technology – If you have children around the house, this feature will be useful to you. 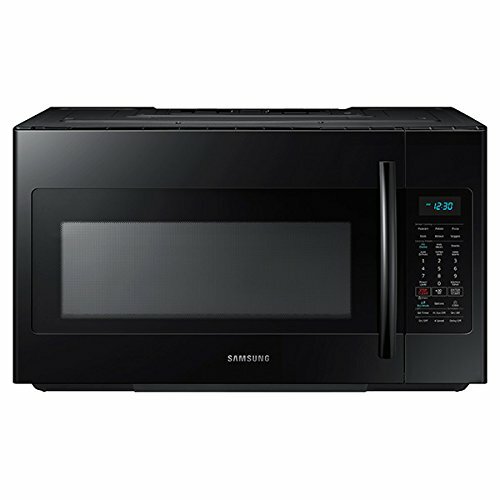 This Samsung over the range microwave is a great product. I really like it a lot. If you’re interested in getting this LG model, go through its most important features first. This is my top 3 choice because I really like it. If you notice, the cons are only minor issues. However, this model is a full-featured over the range microwave oven. It’s also the most spacious of all the products listed here. 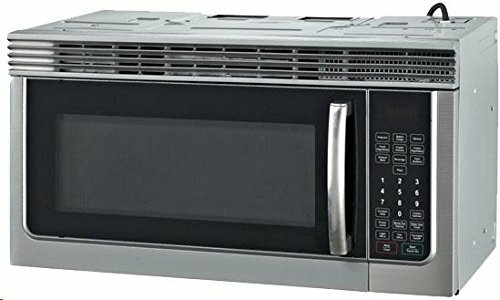 If you’re considering buying this model of over the range microwave, the listed features below will give you an idea if it’s the best choice for you or not. Its capacity and size are 1.6 cubic feet - I'm spacious enough to handle the food preparation for a small family. Stainless steel construction – If you’re particular about color and design, know that this is a stainless steel over the range microwave. It’s a 1,000-watt model. It’s powerful and is equipped with 6 power levels to make sure that your food is always cooked at the right temperature. Pre-programmed settings – This feature allows you to perform cooking tasks at just the touch of a button. Some of the included functions in this model are pizza, fish, vegetables, popcorn, and beverage. Efficient venting system – This unit comes with a 2-speed fan. Lighting system – This feature is useful for monitoring food that’s currently cooking. Turntable functionality – The turntable operation can be turned on/ off as needed. Child-lock safety – This feature is useful if you have children around. Yes, even if they’re able to reach the oven, they will not be able to operate it. What made this model my top 2 choice is its price and quality. Yes, it’s cheap, but the quality is good. The size and power are also enough to handle food preparations for a small family. If your budget is limited, this option would make a good choice. Check out the features of this over the range microwave. See if it impresses you as much as it impressed me. This GE over the range microwave oven comes with a 1.6 cubic feet capacity – it’s ideal for small to medium sized families. It’s made of stainless steel – It’s pretty and long lasting as well. This is a powerful microwave as it comes with 1,000 watts - It’s fast and efficient when it comes to cooking food. It comes with a 300 CFM ventilation system and a 2-speed fan – YYou doesn't have to worry about odor and smoke filling up your kitchen. Turntable system – To guarantee even cooking, use the turntable so that hot air can properly circulate inside the unit. However, this feature can also be turned off – such as when you want to put a large container inside. Cooking settings - With this model, you have the option to choose pre-programmed or manual settings. All the buttons are easily accessible and easy to read. It’s very easy to pick the GE model as my top 1 choice. 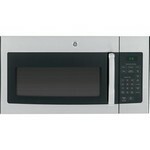 It has a good balance of features, size, and power when compared with other models of over the range microwave ovens. The 10-year warranty also shows that the Company believes in their product’s quality. As for the price, it’s affordable – and the product is worth every penny. Choose from the best of the best when shopping out for an over the range microwave oven (the reviews here will be your guide). With this useful device, your life in the kitchen will be easier. As you can see in the all the above products, these are all beautiful and useful kitchen appliances. They are well designed and functional in their own way and you can choose a stylish and durable unit without breaking the bank. Unfortunately, other brands and models of over the range microwaves didn’t make it into the list. So, if you’re looking for a Sharp over the range microwave, click here. 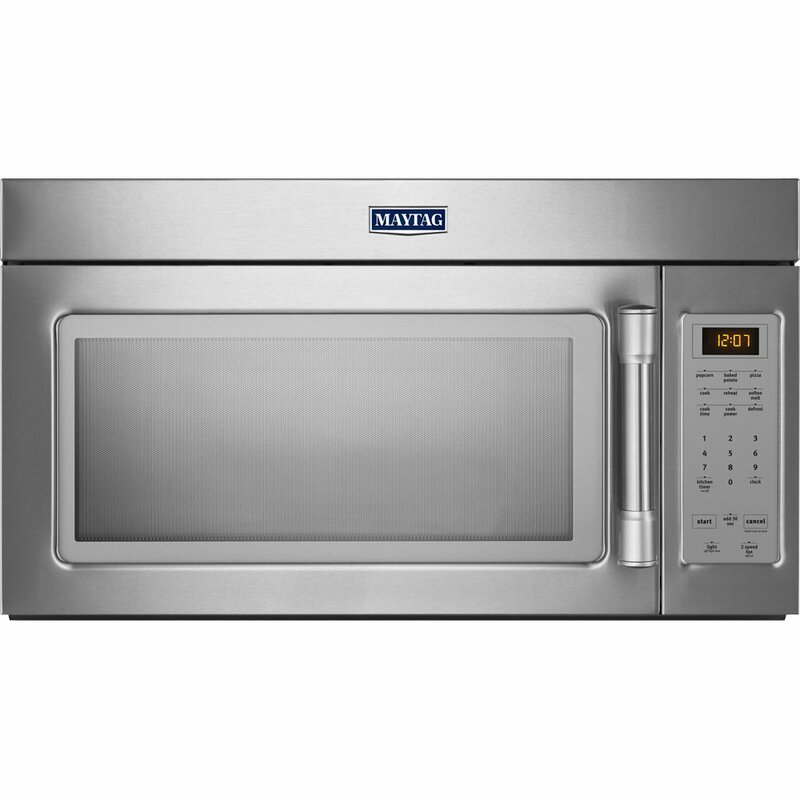 And although I am not recommending any Maytag over the range microwave oven, you can click here to see some of their models. Keep in mind that this type of microwave oven comes in many different sizes, styles, and colors – which is actually good because this gives you a lot of options. An over the range microwave height will depend on the capacity and built of the unit. Also, there are big, wide, and short over the range microwave ovens. If you specifically want a low profile over the range microwave, you might need to settle for a low-capacity model. 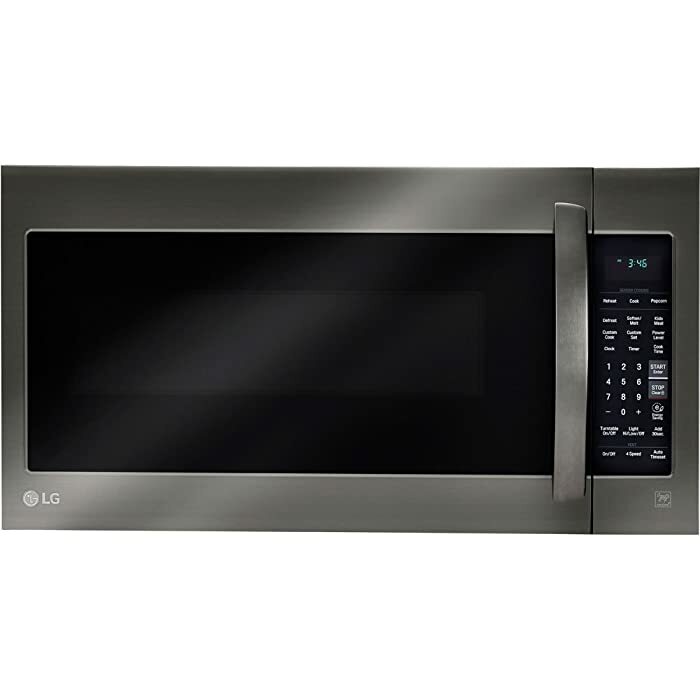 In this case, you might want to consider models of 24 inch over the range microwave ovens over the 36 inch over the range microwaves (which are bigger and bulkier). Click here to watch a video on how to measure an over the range microwave (to make sure that it will fit above your stove). Do take your time in deciding which product to choose – because you will be using this appliance regularly in the kitchen. By picking the best over the range microwave for your needs, your cooking moments in the kitchen will surely be more enjoyable.